If One Looks Carefully, One Can See The Three Places Where Warm Water Is Sneaking In Below (In Green & Blue in WAIS and In East Antarctica). This, paradoxically, does not contradict any of my apocalyptic predictions about Antarctica. 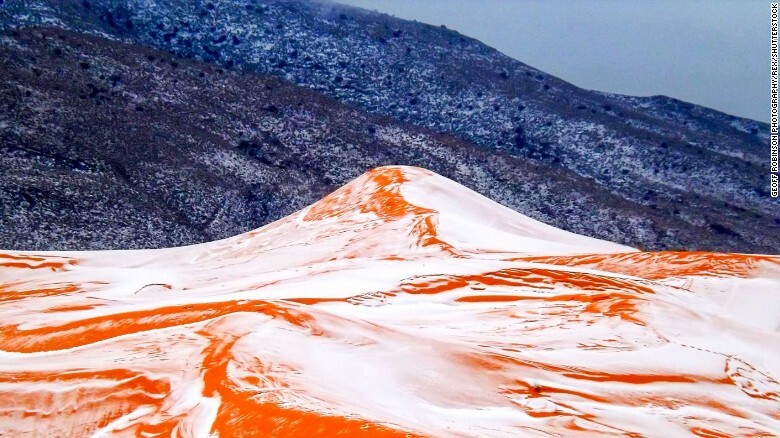 Quite the opposite: a greater snowfall is a mark of a warming climate. Warmer air carries more moisture. The gathering of snow and ice in the interior and at high altitude, over wide expanses has not effect to the melt extending below. In truth, the situation is dire and will evolve quickly. One is reminded of the Space Shuttle Columbia, when hot gases penetrated in its left wing. After they got in, they melted vital equipment all over inside, including hydraulics, and the shuttle struggled for control, finally losing its wing. Antarctica’s ice shelves — the thick, floating slabs of ice which encircle the continent — are melting. The shelves slow and stabilize the glaciers, hundreds of kilometers behind them. They are succumbing to a hidden force: deep, warming ocean currents are melting the ice from beneath ice shelves, and up giant valleys penetrating the continent. 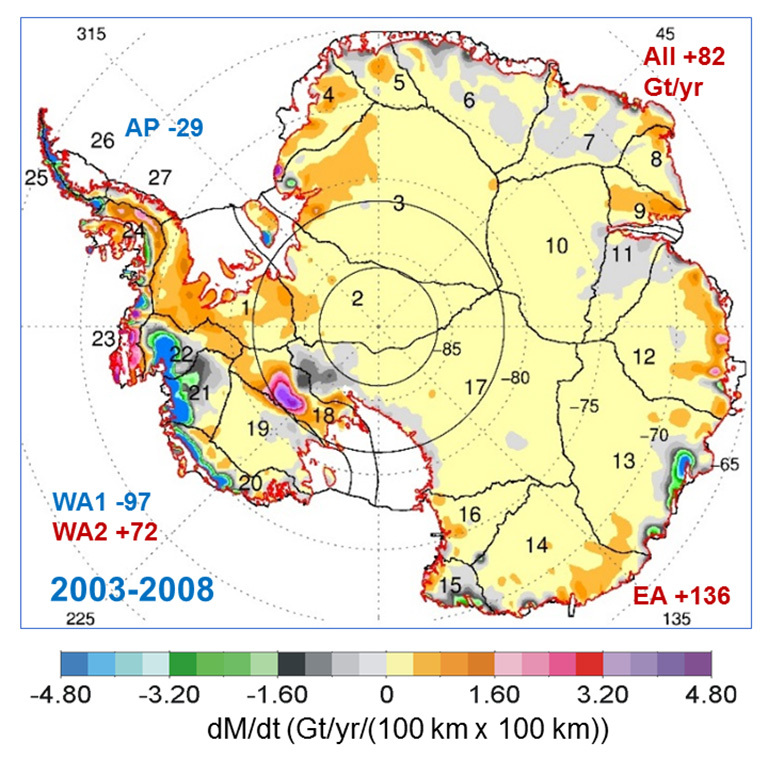 Climatologists speculated in the 1990s that Antarctica might slow sea level rise. They fancied that rising temperatures would produce more water vapor, leading to more snowfall and more ice. This is indeed what the latest NASA study shows. Researchers reported in March, and November 20215, that over the past 20,000 years, warmer temperatures have indeed correlated with higher snowfall: For each Fahrenheit degree of warming, snowfall increased by about 2.7 percent. But that does not mean the threat of fast melting receded..
Glaciologists reported in June that the last remnant of the Larsen B Ice Shelf is splintering, and glaciers flowing into it are accelerating. Its approaching demise continues a disturbing trend: the progressive collapse of five ice shelves since 1989. (“Sweating” was the term used in a scientific report…) While the glaciers in this region seemed stable, warming ocean currents have been melting the belly of the ice. Results published in May show this region crossed a threshold in 2009, with a dozen major glaciers simultaneously starting to thin, “sweating off” 60 billion tons of ice per year. The Amundsen Sea coast is the vulnerable underbelly of West Antarctica. Its glaciers slide on beds that lie nearly a mile below sea level, exposing them to ocean currents. New data show ice shelves are collectively losing 100 billion tons of ice per year, and glaciers have accelerated by up to 70 percent. East Antarctica, situated on high ground that protects it from warming ocean currents, was considered stable, impervious, a Reich to last 10,000 years, strong and dominating. But not exactly, according to surveys with ice-penetrating radar. A March study shows that one large swath of the ice sheet sits on beds as deep as 8,000 feet below sea level and is connected, by very long, deep valleys to warming ocean currents. Totten Glacier, one of East Antarctica’s largest ocean outlets, is already thinning — an ominous sign, since this single glacier drains enough ice from the AURORA Basin to raise the sea level more than all of West Antarctica’s ice loss would. The mouth of the Totten glacier is well north of the southern polar circle. This means that the potential for warming from decreased albedo is considerable. The same story is unfolding with the Wilkes Basin, as I have explained. Thus, right now, sea level is rising slowly, and climate change deniers are chuckling, because Antarctica is gathering warm snow. But, once the warm currents penetrate in force, and they will, Antarctica will go the way of the Space Shuttle: sudden, irresistible disintegration.